When is a Call Option Ratio Spread Appropriate in Futures Markets? The objective is to put this trade on as a credit, a free trade or very cheap. A free trade is one in which a trader collects more premium for the short options that is put forth for the long options. Keep in mind that free does not mean without margin, transaction costs or risk. What is the Risk of a Ratio Call Spread? At the end of June of 2006, the September Crude Oil futures contract was in the process of a rebound from the quarterly low. At the time, it appeared possible that we would see the market retest the all time high of about $77.60 for the September contract, however being a seasonally bearish time of year selling puts in this market would have been unwise. 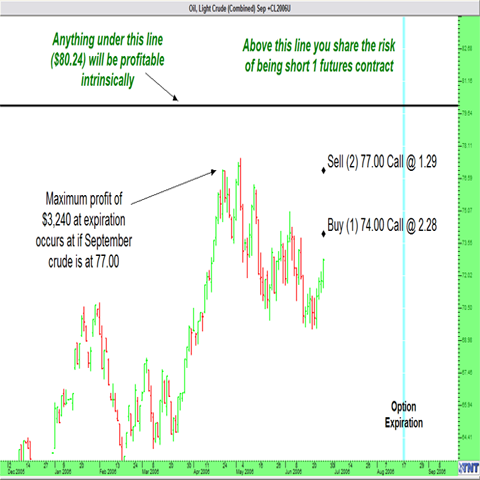 Instead, a trader could have executed a bullish ratio spread by buying the 74 call and selling 2 of the 77 calls. According to Black and Scholes theoretical pricing, this spread could be executed at a credit of about $240 before commission and fees. This trade offers limited risk on the downside. If the market does not rally, or drops instead, the maximum the trader can make is the premium collected before commission. The risk on this trade is actually on the upside. If the trader is too right and the market rallies beyond $80 she is exposed to unlimited risk. The maximum profit on the trade is $3240 ($3 x $1000)+($240) minus commissions paid. Assuming a $40 commission, a trader could potentially net $3240; this occurs at expiration if the underlying is at $77.